Omni-Lampf, Lampf Omni, or just "Lampf", is the third Omni apparatus. When the Omni magnet short-circuited a second time, R. Heffner kindly provided the magnet and stand which had enjoyed a career in µSR at Los Alamos. It has since been fitted with transverse coils and three standard tables for counters and cryostats. The available gap between the main coils, inside the support frame, is 4.75 inches. The maximum field provided is 4.0 kG (0.4 T) at 1000 A (4.0 G/A). The vertical (x) coils give up to 150 G at 500 A (0.3077 G/A or 3.25 A/G), though they are usually used for lower fields. They give a fine homogeneous field, good for muonium precession. 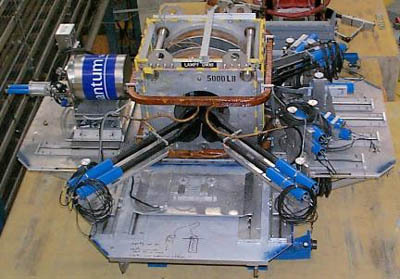 Additional horizontal (y-direction) and longitudinal (z-direction) coils are installed inside the more of the main coils. A cube of three more weak coils is present for zeroing the field.